To estimate carpeting quantity and cost, enter the dimensions of the area you want to cover. Estimate the cost of the carpet and padding you would like to use by adding the price. See below for important information on calculating carpet requirements. How Much (More) Carpet Do I Need? Installing beautiful new carpet can add value and comfort to your home. Carpet comes in many different types and quality with prices that reflect each. It can represent a significant dollar investment and can also be challenging for DIYers to install themselves. But compared to other flooring options, carpet adds an exquisite warmth and sound cushioning to your rooms that can’t be beat. If you are considering other flooring options, though, try our flooring and tile calculators to help you out. The first step is to know how large of an area you want to cover. Since most carpet is sold by the square foot, use feet when measuring your room lengths and widths. If you have the measurements in some other units, use our length calculators to convert. Occasionally, carpet is sold by the square yard. Our square yards calculator will estimate the square yards of your room. With carpet, it is especially important to measure accurately. Measure wall to wall, not baseboard to baseboard. Always measure the widest parts of the room. If the floor plan is complex or there’s multiple rooms, break it up into smaller, regularly shaped sections. Then add the sq. ft. together. Visit our tutorial on how to measure irregular rooms to learn more. Plug the total lengths and widths into the calculator above. The calculator gives you the quantity of carpet and pad required in sq. ft. and sq. yds. To do this calculation yourself, multiple your total floor or wall widths by the total of the lengths in feet to get the total sq. ft. to be covered. Multiply that by 1.1 to add 10% for cuts. Use the result to estimate your cost by multiplying it by the carpet and padding cost per sq.ft. If your material price is in sq. yards, divide by 9 to get sq.ft. For example, let’s estimate flooring for a living room that is 12’ x 15’. You want to use carpeting that costs $54/sq. yd. and padding that costs 50 cents a sq.ft. 12’ x 15’ x 1.1 (10% extra) = 198 sq. ft. Carpet: $54 sq. yd./9 = $6 sq. ft. Unlike some other flooring materials, carpet comes in standard widths. Most carpet is manufactured in 12’ widths, but occasionally you can find widths of 13’ 6” and 15’. Usually, you must buy the entire width for as long a length as you need, no matter your room size. This must be taken into consideration when determining how much carpet to buy. It is especially important when your room is wider than 12’. For example, if your room is 14’ x 14’, that is 196 sq. ft. However, a 12’ wide carpet will not cover the entire width. So, you will need to add extra length to get sufficient carpet for the extra width. Since the flooring is only 12’ wide, you will need two 2’-wide sections to fill in. So, you need to add another 4’ of length to have enough. This makes your carpet requirement 12’ x 18’ = 216 sq. ft. 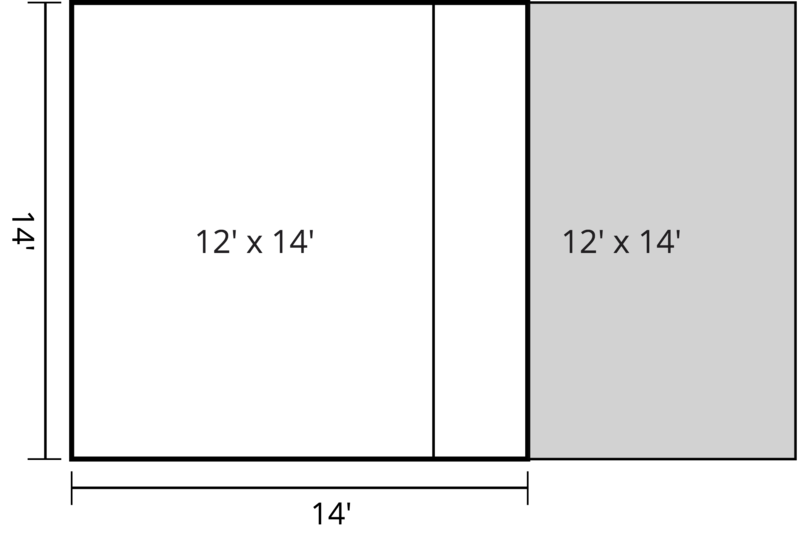 Illustration shows the waste for a 14′ x 14′ room when using carpet that can be laid in any direction. In this example, if you wanted only one seam or if the selected carpet has a pattern that needs to be matched, you would need TWO 12’ wide x 14’ long sections (336 sq. ft.), nearly doubling the material you need to buy. Of course, you’d have a 10’ x 14’ section remaining. This example shows that the style and pattern of carpet can change how much you need to order to cover a floor and that waste can vary from 10% to 90% depending on the room and style. 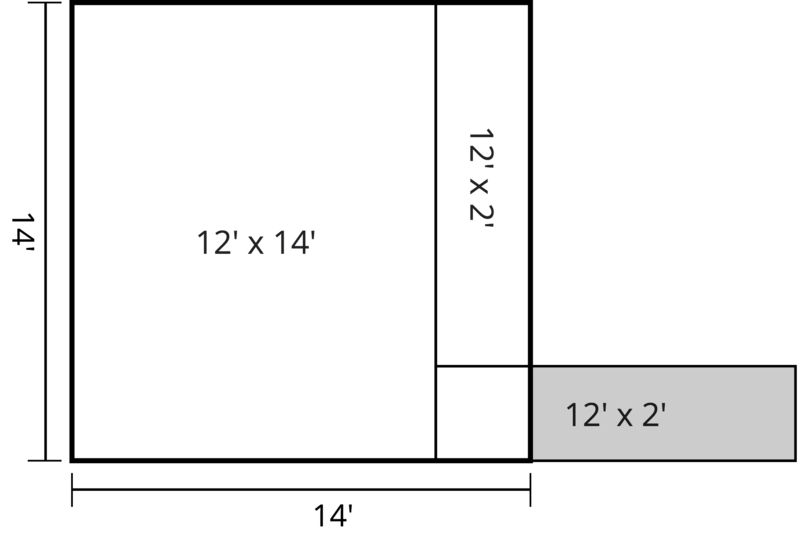 Illustration shows the waste for a 14′ x 14′ room when using carpet with a repeatable pattern. Of course, this amount also depends on where the doorways are and how many seams you want. There are other factors as well. To lay carpet properly, there must be extra around the edges. Patterns and direction of nap need to be matched for a professional look. Seam placement is important too. Carpet seams should not be installed perpendicular to doorways or located in high traffic areas. All this adds up to another 10% or more of material needed. Ask your carpet supplier for help determining your needs. Besides the carpet itself, nearly all carpets require padding underneath. Padding is sold in the same manner as carpet but is much less expensive. Padding ranges from 10 cents to 60 cents a sq. ft.
Costs for carpet can vary widely from $1/sq. ft. for apartment-grade material to over $10 per sq. ft. for luxury natural materials. To help you estimate your cost, you can optionally enter the cost of the carpet and/or the padding you want into the calculator above. This will give you an estimate of material costs for your project. For budgeting purposes, you can add 50 cent a sq.ft. to cover labor costs. If you are installing your own carpet, you will need other materials (floor tape and tackless strip) and specialized tools (e.g., knee kicker, power stretcher, and binder bars) as well. Usually, the equipment can be rented. However, most people pay professionals to install their carpet. It is a skilled job that usually takes professionals less than a day to do. You can find experienced carpet installers in your area here who will come to your house to discuss your project and provide you with free estimates. And soon, you will be on your way to enjoying your new carpeted floors! Find how much tile is needed for a floor or wall by entering the length and width and the size of the tile. Learn how to estimate tile material. Calculate square yards by entering length and width measurements. Estimate material costs and yardage for carpet and flooring projects.